Metal roofing has now entered the mainstream and has become a viable option for nearly all homes, except those with very flat roof pitches. Nor do all metal roofs scream "metal." There are now shingle-style metal roofing products that are almost indistinguishable from traditional asphalt shingle roofs. If you are wondering about the merits of metal roofing, here are 12 things to know. Once, metal roofing was found only on high-end, architect-designed homes. That's no longer true. Metal roofing is increasingly found on conventional houses, thanks to increasing availability and improved manufacturing processes. According to industry statistics, market share for metal roofing has been increasing at a rate of roughly 3 percent each year over the past few years; currently, about 15 percent of all roofing installations use metal roofing materials. At the same time, the market share for asphalt shingle roofing has fallen, now accounting for about 59 percent of the total roofing installed. Metal roofs can be installed over your existing roof without tearing off shingles, provided local building codes allow it. While shingle removal is the preferred route, tear-off is messy and raises the cost of the job. A potential problem with this type of installation is trapped water vapor. If trapped between the metal roofing and old roofing, moisture can build up and cause mold and rot. But roofers can install a vented metal roof that eliminates this potential problem. Or, installing the new metal roofing over furring strips (1 x 3s or similar) will raise the metal and provide a ventilating air pocket between layers. Make sure to consult local buiding codes before having a metal roof installed directly over old shingles. Some jurisdictions may require full tear-off whenever a new roof is installed. Although its a common misconception that metal roofs are noisy when rain or hail falls on them, the reality is that when properly installed, metal roofing is really no noisier than any types. Metal roofing is typically installed over a solid substrate. Additionally, the attic and insulation provide a sound barrier. From interior living spaces, inhabitants almost never notice any increase in sound levels when a metal roof is installed. You might think that a metal roof will attract lighting, but this is not borne out by facts or statistics. According to a technical bulletin from the Metal Construction Association, "Metal roofing does not in any way increase the risk of a lightning strike." Not only that, but if metal roofing does happen to get struck by lightning, it is less combustible than conventional roofing materials such as wood shakes or shingles. The reason that metal roofs do not attract lighting is simple: lighting seeks a path to ground, which is why trees, telephone poles, and other such structures tend to attract lightning. Metal roofs are isolated structural components, with no direct path to ground inherent in their design. Hence, there is no scientific reason for lighting to strike a metal roof any more often than it strikes an asphalt shingle roof. Although most metal roofing products carry warranties comparable to the very best asphalt shingles(about 30 years), in practice, metal roofs have been known to last 50 years or more. According to State Farm Insurance statistics, metal roofs routinely have a longevity of 40 to 70 years. It is therefore very rare for a homeowner to install more than one metal roof over the time he or she lives in the home. By contrast, a homeowner will likely replace an asphalt shingle roof two or even three or four times over a 50-year period. Overall, while the cost of a metal roof is more expensive than ashalt roofing (about double), it can actually save money over a long period. Insects such as termites can never eat metal roofing. Metal roofing is impervious to rot and mildew. Since it conducts heat quickly from the sun, snow slides off more quickly than with conventional roofing. Industry studies show that metal roofs reflect solar radiant heat, which can reduce cooling costs by 10 to 25 percent. In climates where cooling costs are higher than heating costs, coating a metal roof with a shiny or granular coating can maximize the reflective capacity of the roof and improve energy savings. It's often believed that metal roofing is suitable only for roofs with a steep slope, but standing-seam metal roofing can work fine on gently pitched roofs. This type of rooing is installed in large sheets with seams that are raised up and sealed tightly together to resist water. While some slope is necessary to ensure water run-off, most homes can accept metal roofing. Although metal roofs are considerably more durable and maintenance-free than asphalt shingles and other forms of roofing, they are not indestructable. There is one weather condition in particular that bodes ill for metal roofing: large hail. Aluminum and copper is particular can be susceptible to denting when hailstones approach golf-ball size. Steel is harder and fares better in hailstorms, but if you live in a region where such catastrophic hail can occur, be aware of this when considering metal. Pea-sized or even dime-sized hail is rarely a problem, but hailstones larger than this have been known to ruin metal roofs. Then again, large hail can also destroy an asphalt shingle roof, so if you make sure to have good homeowner's insurance that covers such storm damage, there is no reason not to install metal roofing. DIYers have been known to install and repair metal roofing, but it is generally not advised. Metal roofing is generally available only through select retailers, and the techniques for installation and repair are specialized skills. If you opt for metal roofing, you will likely be calling a specialist should problems occur. Fortunately, such problems are rare with metal roofs. On most homes today, attic venting is provided by a continuous ridge vent that runs across the peak of the roof. On a shingled roof, this continuous ridge vent (CRV) is a strip of shingle-like material that runs the entire length of the peak of the house, masking outflow holes on the sides of the ridge. You likely have seen this countless times, but probably never really noticed because the CRV usually lies very flat and blends in perfectly with the surrounding roof. On many metal roofs, especially standing-seam roofs, the CRV is also metal, and it stands out further and is thus much more noticeable. 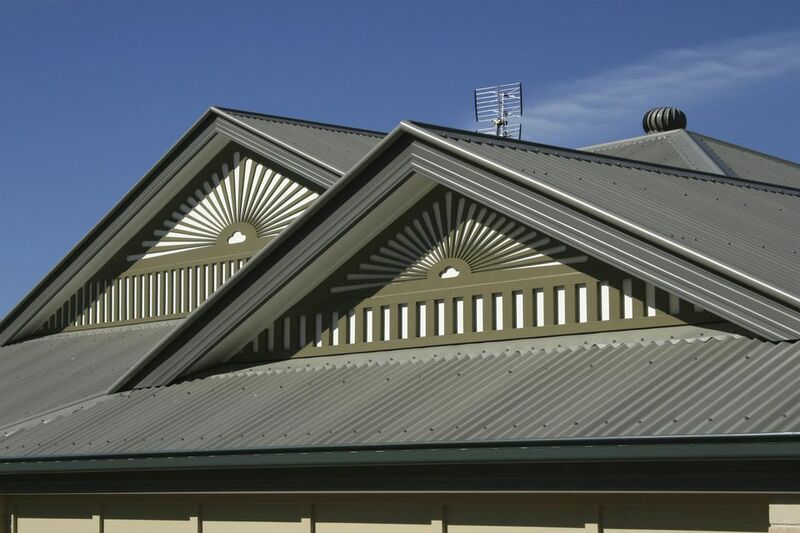 These thick, prominent lines or ridges are inherent in metal roofs and add to their distinctive look. Although metal roofs are very long-lasting, when the time comes to replace one, the old metal is readily accepted at metal recycling outlets. Old asphalt roofing, on the other hand, is usually destined to take up space at a landfill.